Billions of years ago, Earth’s environment was very different from the one we know today. Basically, our planet’s primordial atmosphere was toxic to life as we know it, consisting of carbon dioxide, nitrogen and other gases. 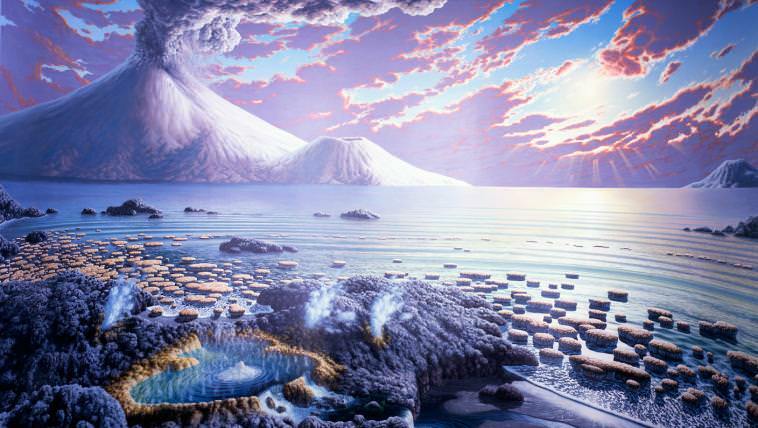 However, by the Paleoproterozoic Era (2.5–1.6 billion years ago), a dramatic change occurred where oxygen began to be introduced to the atmosphere – known as the Great Oxidation Event (GOE). Until recently, scientists were not sure if this event – which was the result of photosynthetic bacteria altering the atmosphere – occurred rapidly or not. However, according to a recent study by a team of international scientists, this event was much more rapid than previously thought. Based on newly-discovered geological evidence, the team concluded that the introduction of oxygen to our atmosphere was “more like a fire hose” than a trickle. The study, titled “Two-billion-year-old evaporites capture Earth’s great oxidation“, recently appeared in the journal Science. Led by Clara Blättler, a postdoctoral research fellow in the Department of Geosciences at Princeton, the team also included members from the Blue Marble Space Institute of Science, the Karelian Science Center, the British Geological Survey, the Geological Survey of Norway, and multiple universities. In short, the Great Oxygenation Event took began roughly 2.45 billion years ago at the beginning of the Proterozoic eon. This process is believed to have been the result of cyanobacteria slowly metabolizing the carbon dioxide (CO2) and producing oxygen gas, which now makes up about 20% of our atmosphere. However, until recently, scientists were unable to place much in the way of constraints on this period. Luckily, a team of geologists from the Geological Survey of Norway – in collaboration with the Karelian Research Center in Petrozavodsk, Russia – recently recovered samples of preserved crystallized salts in Russia that are dated to this period. They were extracted from a 1.9 km-deep (1.2 mi) hole in Karelia in northwest Russia, from the the Onega Parametric Hole (OPH) drilling site on the western shores of Lake Onega. These salt crystals, which are roughly 2 billion years ago, were the result of ancient seawater evaporating. Using these samples, Blättler and her team were able to learn things about the composition of the oceans and the atmosphere that existed on Earth around the time of the GOE. For starters, the team determined that they contained a surprisingly large amount of sulfate, which is the result of seawater reacting with oxygen. Prior to this, scientists were unsure how long it took for our atmosphere to reach its current balance of nitrogen and oxygen, which is essential for life as we know it. Basically, opinion was divided between it being something that happened rapidly, or occurred over the course of millions of years. Much of this stems from the fact that the oldest rock salts discovered were dated to a billion years ago. “It has been hard to test these ideas because we didn’t have evidence from that era to tell us about the composition of the atmosphere,” said Blättler. However, by discovering rock salts that are roughly 2 billion years old, scientists now have the evidence they need to place constraint on the GOE. The find was also very fortunate, given that such rock salts samples are rather fragile. The samples used for this study contained halite (which is chemically identical to table salt or sodium chloride) as well as other salts of calcium, magnesium and potassium – which dissolve easily over time. However, the sample obtained in this case was exceptionally-well preserved deep within the Earth. As such, they are able to provide scientists with invaluable clues as to what happened around the time of the GOE. These models are also likely to help in the hunt for life beyond our Solar System. By understanding what took place on our own planet billions of years ago to make it suitable for life, we will be able to spot these same conditions and processes on other planets.